Tax Reform is here, and most individuals and business owners are wondering the impact on their personal and business taxes. Below is a general summary of the anticipated tax law changes that will be effective January 1, 2018, through December 31, 2025. Under the new law, mortgage interest on loans used to acquire a principal residence and a second home is only deductible on debt up to $750,000 (down from $1 million), starting with loans taken out in 2018. There is no longer any deduction for interest on home equity loans, regardless of when the debt was incurred. This exclusion allows individuals to exclude gain of up to $500,000 (for joint filers) from the sale of a primary residence. The taxpayer must own and use the home as their primary residence for two out of the previous five years. The exemption can only be used once every two years. Old Tax Rules: An individual making alimony or maintenance payments may deduct the payments. The individual receiving the payments must include the payments as income (includible in that spouse's gross income). 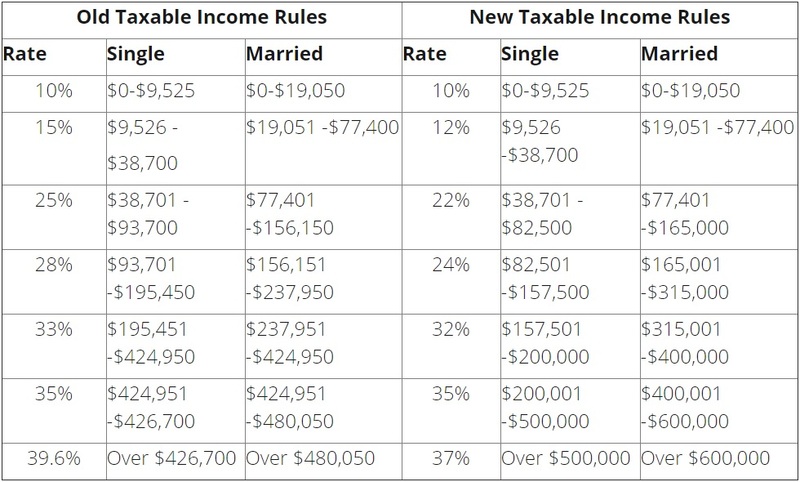 New Tax Rules: The payor no longer receives a deduction for alimony or maintenance payments. The recipient of the payments is not required to include such payments as income. A taxpayer will only be allowed to deduct a combined total of $10,000 for state and local taxes, property taxes and income taxes. Deductions related to tax preparation fees and electronic filing fees are no longer allowed. In addition to higher education, tax-free distributions may now be used for tuition related to enrollment and attendance at elementary or secondary schools, public and private. For cash contributions to public charities and certain private foundations, charitable deductions are increased from 50% to 60%. Any contribution exceeding 60% of the Taxpayer’s AGI may be carried forward and used in subsequent years, for up to five years. The taxpayer does not need to provide a written receipt (contemporaneous written acknowledgement). Any individual without health insurance will no longer be penalized on their federal tax return. Estate and gift tax exemptions have been increased from $5 million to $10 million. These exemptions are indexed for inflation annually, starting in 2011. This brings the exemption amount to approximately $11.2 million for 2018, and $22.4 million per married couple, with some basic portability techniques. Starting in 2018, taxpayers are allowed a deduction equal to 20 percent of “qualified business income,” otherwise known as “pass-through” income (i.e., income from partnerships, S corporations, LLCs, and sole proprietorships). The income must be from a trade or business within the U.S. Personal service business and investment income does not qualify, nor do amounts received from an S corporation as reasonable compensation or from a partnership as a guaranteed payment for services provided to the trade or business. The deduction is not used in computing adjusted gross income, rather, just taxable income. For taxpayers with taxable income above $157,500 ($315,000 for joint filers), (1) a limitation based on W-2 wages paid by the business and depreciable tangible property used in the business is phased in, and (2) income from the following trades or businesses is phased out of qualified business income: health, law, consulting, athletics, financial or brokerage services, or where the principal asset is the reputation or skill of one or more employees or owners. The purpose is to cap the businesses’ tax rate at 25 percent, rather than having to pay the higher ordinary income tax rate. The new law increases the credit for qualifying children (i.e., children under 17) to $2,000 from $1,000, and increases to $1,400 the refundable portion of the credit. It also introduces a new (nonrefundable) $500 credit for a taxpayer's dependents who are not qualifying children. The adjusted gross income level at which the credits begin to be phased out has been increased to $200,000 ($400,000 for joint filers). The corporate tax rate has been reduced to a flat 21%. It also eliminates the corporate alternative minimum tax. Property placed in service in tax years after December 31, 2017, the maximum amount a taxpayer may expense up to $1million and the phase-out threshold amount is increased to $2.5 million. These numbers are indexed for inflation after 2018. For amounts incurred or paid after Dec. 31, 2017, deductions for entertainment expenses are disallowed, eliminating the subjective determination of whether such expenses are sufficiently business related; the current 50% limit on the deductibility of business meals is expanded to meals provided through an in-house cafeteria or otherwise on the premises of the employer; and deductions for employee transportation fringe benefits (e.g., parking and mass transit) are eliminated. However, the exclusion from income for such benefits received by an employee remains. In addition, no deduction is allowed for transportation expenses that are the equivalent of commuting for employees (e.g., between the employee's home and the workplace), except as provided for the safety of the employee. For NOLs arising in tax years ending after Dec. 31, 2017, the two-year carryback and the special carryback provisions are repealed, but a two-year carryback applies in the case of certain losses incurred in the trade or business of farming. The cost recovery period is shortened from seven to five years for any new (original use start with taxpayer) machinery or equipment (other than any grain bin, cotton ginning asset, fence, or other land improvement) used in a farming business. The separate definitions of qualified leasehold improvement, qualified restaurant, and qualified retail improvement property are eliminated, a general 15-year recovery period and straight-line depreciation are provided for qualified improvement property, and a 20-year ADS recovery period is provided for such property. The ADS recovery period for residential rental property is shortened from 40 years to 30 years. If you have questions, contact attorneys Gini Hendrickson and Jason Reed or follow up with your tax preparer.